This makes such a cute and easy vegan appetizer. 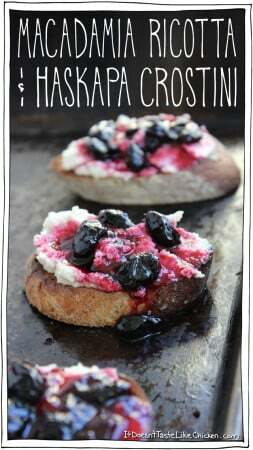 Recipe for vegan macadamia ricotta, toast baguette slices, then top with a haskap berry relish! To Make the Macadamia Ricotta: Add macadamia nuts, lemon juice, nutritional yeast, white miso paste, garlic, and 1/4 cup of water to a food processor. Blend well until smooth and creamy, stopping to scrape down the sides often. Add more water as needed 1 Tablespoon at a time until a creamy ricotta texture is reached. To Assemble the Crostini: Preheat your oven to 425F (220C). Take the slices of baguette and lightly brush a bit of olive oil on both sides of the slices, and spread in a single layer on a baking sheet. Bake 10 minutes, flipping once half way through until the baguette slices are nicely toasted. Spread 1 to 2 tablespoons of the macadamia ricotta onto each toast, and then spoon over 1 to 2 tablespoons of the Haskapa Jalapeño Relish. Sever right away. *For an Oil Free version, just skip oiling the bread, and toast dry keeping a close eye on the toast so it doesn't burn.